Amazon believes the future of grocery shopping is online. So why is the retail giant spending $13.7 billion to acquire 460 brick-and-mortar Whole Foods stores and lower prices on "organic bananas" and "responsibly-farmed salmon?" Answer: To dominate the grocery business like it has many others by increasing the number of customers while undercutting the competition. Amazon will make Whole Foods more accessible to more consumers. And it will turn them into Amazon customers and advance its bid to become the dominant player in all of retail -- the so-called everything store. "The pot of gold at the end of the road for Amazon is groceries," said Cooper Smith, an Amazon analyst at L2 Inc. "The war for retail will be won in groceries. It's the largest category of consumer retail, and the largest untapped opportunity for Amazon." With lower prices for higher quality goods, Amazon is posing a direct threat to America's major supermarkets. The six largest food retailers, which had already taken a hit after the Whole Foods acquisition was announced in June, lost roughly $12 billion in value after Thursday's announcement about the company's intention to lower prices. That market disruption is based not on what Whole Foods is today, but on what it can become. 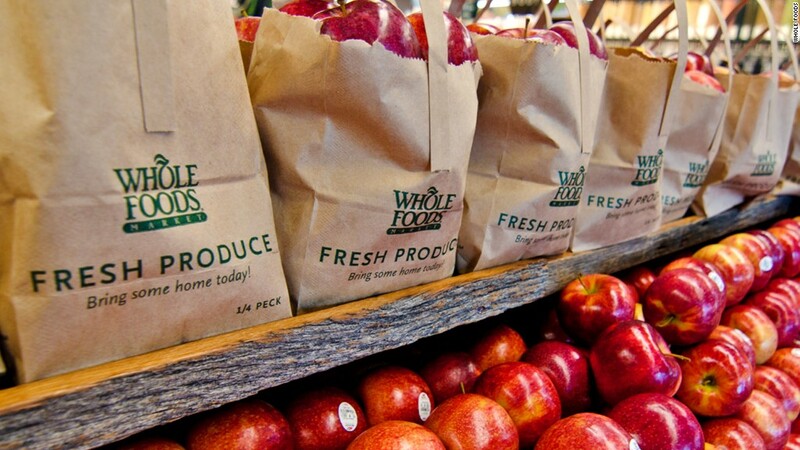 Whole Foods currently represents less than 2% of the overall grocery market. But under Amazon (AMZN), those stores will be turned into warehouses that can distribute groceries to homes around the country. Meanwhile, Amazon's distribution centers can also function as Whole Foods (WFM) distribution centers. There is room for expansion, as well. By lowering its prices, Amazon can open new Whole Foods locations in markets that traditionally could not afford high-priced organic bananas and responsibly farmed salmon, making a run at companies like supermarket leaders like WalMart and Kroger. "Generally Whole Foods goes into markets with six-figure incomes and college-educated residents. But with Amazon lowering Whole Foods' prices, you could get Whole Foods in towns where you don't traditionally see them," supermarket analyst David J. Livingston said. "It could open the doors for any medium-size city in the country." With every new Whole Foods customer, Amazon will expand its core business, which is based around the Amazon Prime membership. On Thursday, Amazon announced that Amazon Prime will become Whole Foods' customer rewards program, giving Prime members "special savings and in-store benefits." As consumers grow more comfortable doing their grocery shopping online, Amazon is hoping that Whole Foods customers will become Amazon Prime customers. By then, Amazon Prime could become a one-stop shop for all consumer needs, from groceries and clothes and home appliances to on-demand entertainment and concert tickets. This is where things could get challenging for Amazon. As its consumers base grows, the company will have to drastically increase its shipping and delivery capabilities. "It's an extremely large undertaking," Smith said. "Amazon has never operated a brick-and-mortar presence at this scale. Wall Street might come down on Amazon a little harder -- might say they're over-leveraged, spending too much money, in a war with WalMart. So they have to maintain the perception that everything is going to be all right." Amazon's competitors are already taking steps to react. Earlier this week, WalMart (WMT) said that it would start offering its products on Google Express, the search company's online shopping mall. But industry experts say the Google-WalMart deal has little chance of getting in the way of Amazon's ambitions. In a note to clients, Cowen analyst John Blackledge said the partnership "had little to no impact on Amazon's retail business or the growth of Amazon Prime households." "While we are encouraged to see Google continue to enhance its eCommerce/Shopping offering, we believe the attention the announcement received was overblown," Blackledge wrote, noting that only 4% of U.S. households that buy products online bought groceries via Google Express in July. Smith dismissed the deal as "symbolic," while Livingston said it seemed like a reactionary move geared toward appeasing shareholders. "They have to make a change, stay relevant and give shareholders some benefit," he said. "If the shareholders don't see WalMart doing something they get nervous and say maybe we should sell our stock and do something else." "Half of Amazon's strategy is to cause a disruption, make other retailers go out and make a mistake because they're just trying to impress shareholders and get in the paper," Livingston added. For now, WalMart, Kroger (KR) and a handful of other supermarket companies still dominate the market. But under Amazon, Whole Foods poses a legitimate threat. "The traditional supermarket is becoming a dinosaur," Livingston said. "It's not going to happen tomorrow, but it's going to happen. We're going to see a shift in the way people shop."